Control your Smart Home right from your smart phone. A “Smart Home” may sound like a thing of the future, but with today’s home automation technology and a high-speed Internet connection, you can be well on your way turning your house into your very own Smart Home. What exactly does that mean? A Smart Home is one that utilizes the Internet of Things (i.e. all of the devices in your home that are connected to the Internet with the ability to communicate with each other) for home automation. 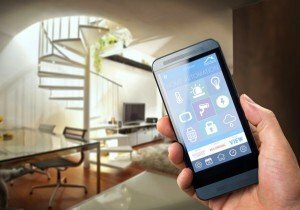 Long thought of as a far-off technology or only for the wealthy, home automation is now available to the average consumer and is being used to propel safety and security into the 21st century. At OTELCO, we believe that high speed, reliable connectivity is about so much more than just entertainment. It’s about making homes and families even safer. Our goal is to help our customers increase security and efficiency in their homes by making the most of automation services available today. Security cameras are nothing new, but home automation takes security one step further, with options like high-definition video monitoring, window and door sensors, motion detectors, an alert siren, and push notifications straight to your smart device if the alarm system is ever triggered. It even allows for the peace of mind of checking door locks remotely, to make sure things are secure, even on the days you rush out the door without double checking that it was locked behind you. According to the National Alliance for Caregiving, 9.3 million Americans find themselves taking care of aging parents. The newest technology lends a hand for those who wish to remain independent in their own homes. Video cameras and emergency buttons can be monitored by family and immediately notify emergency services if needed, even if your loved one isn’t able to speak. You can also make sure your own home (and that of your loved one) remains safe while you’re away with devices that will send push notifications to your phone if smoke, carbon, or even water sensors are triggered. Just as your thermostat drives home temperatures to your desired setting, home automation allows you to more carefully manage the power used by lighting and electrical outlets. With your smartphone acting as a remote control, home automation offers the ability to power devices on or off on schedule and control them on the go. You can also track usage in real time, so you’ll know when you’re driving up your electric bill and where you can cut back, as well as having the ability to power down energy hungry electronics even if you’re not home. OTELCO has options for all of our customers to take advantage of advancements in home automation. In Alabama, we offer Home Security with 24/7 professional monitoring and a Medical Alert System that contacts emergency services at the push of a button. Our New England customers can maximize their OTELCO experience with the addition of Mivatek Home Automation, which offers cloud-based security and automation powered by your broadband connection and managed through your smartphone. Whatever your location, we can help you select the services that will help make home automation work for you.